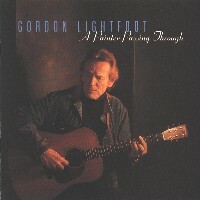 Lightfoot's 19th original album was released in May, 1998. It had been a long five years since his last album, but well worth the wait. This album is an aptly named reflection on his life and his career. Most of the original songs touch on autobiographical themes, as has often been the case in the past. In addition to eight original songs there are two covers, both country songs. The music is exceptional: melodies, arrangement, backup vocals; the sound crisp and clear. Even after a recording career spanning more than 35 years, his warm baritone is still pleasant and his trademark phrasing as infectious as ever. There is no mistaking a Lightfoot recording. The title song, depicting Lightfoot as a painter, is the highlight of the album, but careful listening will convince you that the complete set of songs paints a picture as well. With the original songs and the two carefully chosen covers, Lightfoot has once again both bared his soul and translated what he sees, hears and feels into beautiful music. Lightfoot plays 6, 12-string and high string guitar and is backed up by his four man band, whose members have been with him for many years and with whom he tours. On this album, he also has several guest musicians including Daniel Lanois and Pee Wee Charles (the latter a former member of the Lightfoot band). The additional backup musicians add attractive highlights to the music, but the songs when performed in concert sound exceptional with only the Lightfoot band. This common sound on his albums and in concert is only possible with an artist who doesn't use gimmicks, but just records his music honestly and naturally. My favorite songs are the title track ('A Painter Passing Through'), 'Drifters', and 'Much To My Surprise', all of which are highly autobiographical. It may take a few listenings to fully appreciate the meaning of the lyrics, but interpreting his lyrics has always been one of the extra pleasures offered by his songwriting. I also love 'On Yonge Street' - and you will too, even if you've never been to Toronto. And, for the Country Music fans among us, the two country songs are a delightful treat ( 'I Used To Be A Country Singer' , by Steve McEown and 'Red Velvet', by Ian Tyson). Unlike on some of his other recent albums, on this album his guitar playing can heard distinctly and is never overwhelmed by the arrangement. Taken as a whole, the album is a pleasure to listen to; I have few albums that I enjoy playing through from start to finish and this is one of them. We are very lucky indeed that Lightfoot is still at his craft. The complete track list is below. Click on song title to hear clip. Michael Killen, then at Country.com, picked this album as one of his five favorite new releases of 1998, placing it on the Country.com list of Top Disc Picks Of The Year.